Yup, give your kids Wonder Bread to make them smart. Recommendations generally are for children to have 2 servings of fish weekly for them to consume enough healthy fats (DHA) which may have benefits in brain development. So how much bread would you have to eat to get the DHA of two weekly serving of fish? Well my friends over at CBC Marketplace in their most recent show figured that out for us (and it's well worth a watch - only 6 minutes). Want to wager a guess? My guess is you'll be wrong, unless of course you guessed 428 slices of bread. 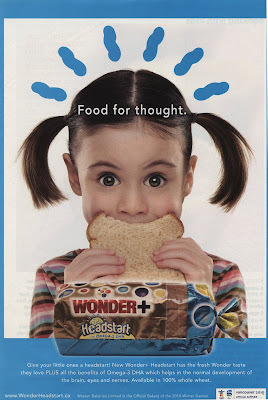 How nice of Wonder Bread to prey on parents wanting to help their children. Shouldn't there be laws against this type of badvertising?